Paintings by Susan Merrill will be shown at Hancock Shaker Village. Hancock Shaker Village kicks off its 2011 season with a painting exhibition titled “Black & White Barnyard” by Stockbridge-based artist Susan Merrill. The exhibition will run during “Baby Animals on the Shaker Farm” April 16 through May 8 from noon to 4pm daily in the Poultry House. 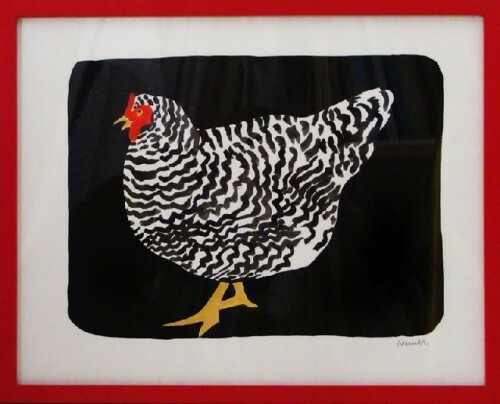 It will feature paintings of animals with black and white markings from the Village and surrounding local farms. Proceeds from the sale of these works will help to support programming at Hancock Shaker Village. An opening reception will be held on Sunday, April 10 from 4pm to 6pm. RSVP required. Please call 413.443.0188 x115. A graduate of Bennington College with a Master of Arts in Teaching degree from UMass Amherst, Merrill also studied art for two years at the l'Accademia delle Belle Arti in Rome. She taught art for several years at Berkshire Country Day School and has exhibited at various local galleries. She lives in Stockbridge with her husband, Carl Sprague, and their two children, Ruslan and Elena Sprague.